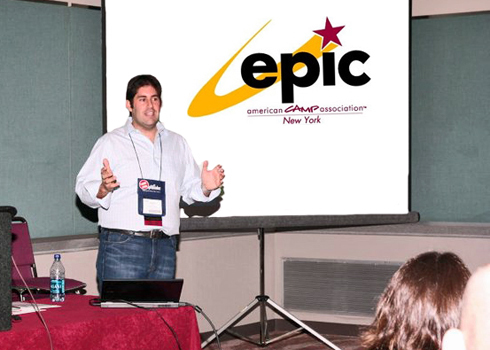 The 2011 Tri-State Camp Conference that took place in Atlantic City was in fact “epic.” So epic that over 100 camping professionals got together the day before the conference began for an EPIC meeting of their own! The Emerging Professionals in Camping (EPIC) program featured none other than the legend in the camping industry himself, children’s development expert, Bob Ditter. His session, “Understanding Today’s Children and the Big Picture for Camp Professionals,” truly gave everyone participating a different perspective on our campers that reflect today’s society. It isn’t everyday that camp professionals from all over the tri-state area get to combine eager minds and ideas while learning from the leading child expert in the summer camp industry. Many of us know Bob Ditter from his famous sayings: “Don’t pick up the Rope” or “You have been Ditterized,” but this program provided all attendees with an inside glimpse on how to deal with today’s issues in camp which are very different from the camp of yesteryear. Bob touched on many current issues we experience with our campers: he noted that cell phones are now actually mobile computers and are only one of the many “screens” children spend hours looking at on a daily basis. Free time has dwindled dramatically in the last ten years for children and they now spend less and less time in good old fashion spontaneous play. Bob touched on what this means for camping professionals like us going forward and how to evolve our own skills in order to meet the challenges of today’s campers. Everyone walked away from the 5-hour session with more tools, strategies and confidence about working with today’s campers as well as with some laughs and new friends in the camping industry. During our summer orientation, the TLC Family of Camps is fortunate to have Bob work hands-on with our counselor staff teaching them the ability to deal with our campers of today. Our own TLC Family of Camp Directors, Dave Skolnik and Justin Mayer, helped set up the successful event and we all look forward to doing it again in 2012!